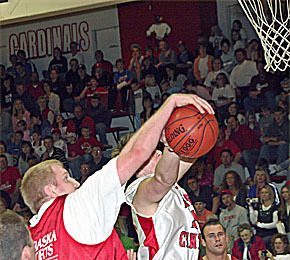 A packed house at the Boone Central gymnasium in Albion was thoroughly entertained Saturday night as 2007 senior members of the University of Nebraska football team played a charity basketball game against seniors from area high schools. The event was sponsored by the Boone County Health Center Foundation to raise funds for AED’s (Automatic External Defibrillators) that will be placed in area high school gyms. Several recognizable Nebraska stars were part of the Husker Hoops team, including LB Corey McKeon and WR Terrence Nunn. Also competing for the Huskers were Josh Mueller, Victory Haines, Ben Eisenhart, Andy Sand, Sean Hill, Matt Senske and Tyler Kester. Representing the Boone County Health Center area were high school seniors Anthony Michael, Matt Cook and Beau Beckwith from Boone Central, St. Edward’s Shavontae Samuels and Zach Tharnish, Evan McIntyre of Cedar Rapids, Ryan Nathan from Newman Grove, Michael Pritchard of Spalding/Spalding Academy, Dean Veik of Pope John Central, Fullerton’s Sam Scott and Lucas Weeder from Lindsay Holy Family. The Husker Hoopsters used some “physical” fourth-quarter play and late free throws to key a comeback victory in the game and McKeon capped the 86-77 decision with a long three-point field goal at the final buzzer. The outcome wasn’t really the important part of the evening, however. Boone County Health Center officials estimated that nearly 900 people attended the event, with the BCHC raising approximately $2,500. Vic Lee, CEO and President of the BCHC, said he was “very happy with the turn-out and support brought by all the communities within the service area of the hospital”. Dr. Brad Hupp talked to the crowd at halftime about AED’s and their importance in saving lives in cardiac emergencies. The Newman Grove Dance Team also entertained at halftime and the Fullerton Pep Band performed throughout the evening.